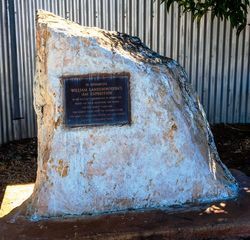 A monument commemorates William Landsborough's 1861 expedition. 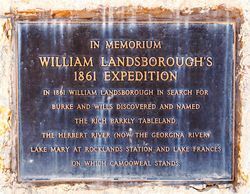 In August 1861 Landsborough was placed in charge of an expedition to search for Burke and Wills, starting from the Gulf of Carpentaria. On 1 October the party of four whites and four aborigines arrived by ship at the mouth of the Albert River at the site of current Burketown with 25 horses. 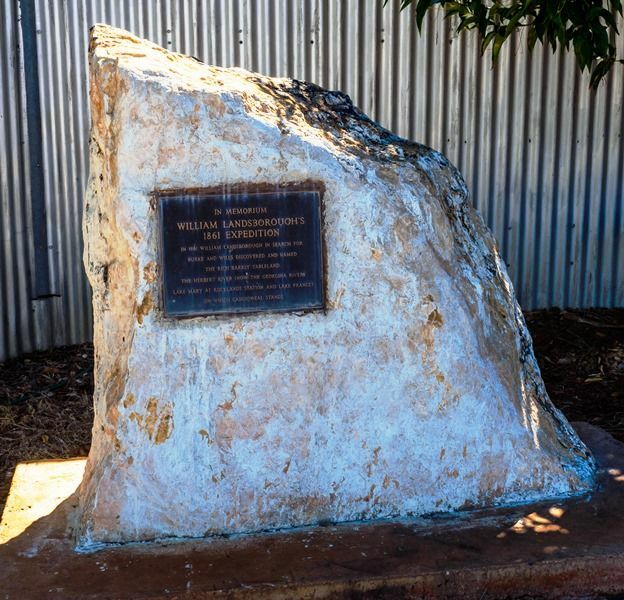 Landsborough started on 16 November south west in the direction of Central Mount Stuart. He discovered and traced the Gregory River to its source, then skirted the Barkly Tableland and found an inland river flowing south, which he named the Herbert, which was later renamed the Georgina River. Little water could be found and no trace of Burke and Wills and, deciding to return, he arrived at his depot at the Albert River towards the end of January 1862. In 1861 William Landsborough In Search For Burke And Wills Discovered And Named The Rich Barkly Tableland, The Herbert River (Now The Georgina River), Lake Mary At Rocklands Station And Lake Frances On Which Camooweal Stands.